I just upgraded to 6.0.1 and now when I try and add custom menu items to the menu bar, nothing happens and the default ones remain. 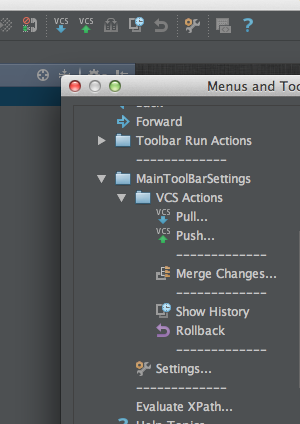 When I go back into the edit screen it has kept my changes, but they are not reflected in the toolbar (see attachment). BTW: The 2 git commands in the toolbar are the default Fetch (not pull as in my custom one) and Commit Changes (not Push as in mine). I've tried restarting PHPStorm, restarting the machine all kinds of things but to no avail. has anyone got any ideas what the issue might be, or whether I'm doing anything wrong - but I had them set up in exactly the same way in 6.0 and they worked fine. As I understand from your screenshot you have added few separators between VCS actions, right? If so -- it's a known issue: http://youtrack.jetbrains.com/issue/IDEA-104509 -- watch/vote/etc to get notified when it will be fixed.